Given below is the list of 3D charts that fall under the Pie/Doughnut Chart category. Caution: To view a chart in 3D, open the ChartArea Collection Editor in the ChartAreas property and set the ProjectionType property to Orthogonal. A 3D doughnut chart shows how the percentage of each data item contributes to a total percentage, allowing the data to be viewed in a 3D format. The Clockwise property gets or sets a value indicating whether to display the data in clockwise order. The ExplodeFactor property gets or sets the amount of separation between data point values. The value must be less than or equal to 1. To explode one section of the doughnut chart, set ExplodeFactor to the data point instead of the series. The HoleSize property gets or sets the inner radius of the chart. If set to 0, the chart looks like a pie chart. The value must be less than or equal to 1. The OutsideLabels property gets or sets a value indicating whether the data point labels appear outside the chart. The Radius property gets or sets the size of the doughnut within the chart area. The StartAngle property gets or sets the horizontal start angle for the series data points. 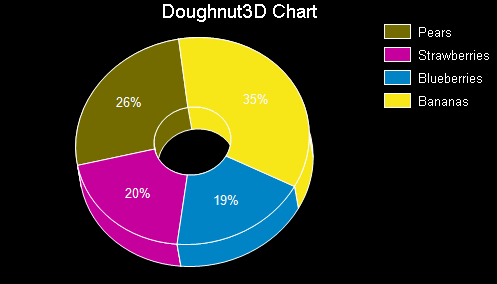 Below is an example of how to set the custom chart properties at run time for a 3D doughnut chart as shown in the image above. A 3D funnel chart shows how the percentage of each data item contributes to the whole, allowing the data to be viewed in a 3D format. The BaseStyle property gets or sets a circular or square base drawing style for the 3D funnel chart. The CalloutLine property gets or sets the style for a line connecting the marker label to its corresponding funnel section. The default value is a black one-point line. The FunnelStyle property gets or sets the Y value for the series points to the width or height of the funnel. The default value is YIsHeight. The MinPointHeight property gets or sets the minimum height allowed for a data point in the funnel chart. The height is measured in relative coordinates. The NeckHeight property gets or sets the neck height for the funnel chart. This property can only be used with the FunnelStyle property set to YIsHeight. The default value is 5. The NeckWidth property gets or sets the neck width for the funnel chart. This property can only be used with the FunnelStyle property set to YIsHeight. The default value is 5. The OutsideLabels property gets or sets a value indicating whether the labels are placed outside of the funnel chart. The default value is True. The OutsideLabelsPlacement property gets or sets a value indicating whether the data point labels appear on the left or right side of the funnel. This property can only be used with the OutsideLabels property set to True. The PointGapPct property gets or sets the amount of space between the data points of the funnel chart. The PointGapPct is measured in relative coordinates. The default value is 0, and valid values range from 0 to 100. The RotationAngle property gets or sets the left-to-right rotation angle of the funnel. The valid values range from -180 to 180 degrees. This property is only effective with the Projection property set to Orthogonal and the BaseStyle property set to SquareBase. Below is an example of how to set the custom chart properties at run time for a 3D funnel chart. A 3D Pyramid chart shows how the percentage of each data item contributes to the whole, allowing the data to be viewed in a 3D format. The BaseStyle property gets or sets a circular or square base drawing style for the 3D pyramid chart. The CalloutLine property gets or sets the style for a line connecting the marker label to its corresponding pyramid section. The default value is a black one-point line. The MinPointHeight property gets or sets the minimum height allowed for a data point in the pyramid chart. The height is measured in relative coordinates. The OutsideLabels property gets or sets a value indicating whether the labels are placed outside of the pyramid chart. The default value is True. The OutsideLabelsPlacement property gets or sets a value indicating whether the data point labels appear on the left or right side of the pyramid. This property can only be used with the OutsideLabels property set to True. The PointGapPct property gets or sets the amount of space between the data points of the pyramid chart. The PointGapPct is measured in relative coordinates. The default value is 0, and valid values range from 0 to 100. The RotationAngle property gets or sets the left-to-right rotation angle of the pyramid. The valid values range from -180 to 180 degrees. This property is only effective with the Projection property set to Orthogonal and the BaseStyle property set to SquareBase. Below is an example of how to set the custom chart properties at run time for a Pyramid chart. This type of chart displays the contribution of each value to a total. This chart type uses rings (inner and outer) to represent data.